Reactor radiation working up food chain! Recently I posted a blog titled, “Titanic Sails from Fukushima” . I thought I had added a sufficient number of tags which should have attracted some interest. Unfortunately, it did not. In that article I attempted to illustrate how devastating the effects of radiation can be on even the smallest members of the food chain. Once subjected to radiation in the form of Iodine 131, low-level bacteria/algae forms Protococcus, as well as phytoplankton and seaweeds, specifically brown algae will eventually mutate and die. The long term effects of course go all the way up the food chain effecting marine mammals the top of consumers in the ocean . The Dahl Porpoises, Western Pacific Grey Whales, and Humpback Whale( 21 marine mammal species in all which can be found in article by Whiting that follows) as top end consumers will undoubtedly be effected in the long-term if not short-term. The news earlier this week as indicated in the article above places sand lance from waters adjacent to the Fukushima Nuclear facility to be contaminated and no longer to be sold or eaten by the public. Sand Lances are familiar to the Oregon Coast where we live. 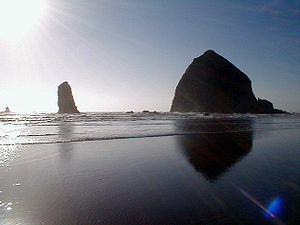 They are part of the diet of our locally famous Tufted Puffins that can be found at Haystack Rock in Cannon Beach, OR. The consequences of this revelation mean that bottom dwellers such as the identified sand lance have picked up potentially lethal amount of radiation and for certain will transfer it to marine seabirds, marine mammals, and other sea and shore life in that region or any other consumer as well. Gray Whales in this case, those migrating along the Pacific side of Japan will be effected. As filter feeders who actually use their pectoral fins to dig up the sandy near shore bottoms in search of food, which becomes suspended, will be impacted. The experts will claim that the dilution is a solution. I would argue just the opposite, certain organisms are bio accumulators and will certainly suffer the consequences.The only answer is the voice of the people. Oregonians ended nuclear power by the initiative process and affectively shut down our only plant, The Trojan Nuclear Plant formerly of Ranier, OR. Until answers to the storage issues are solved Oregon will have NO Nukes. 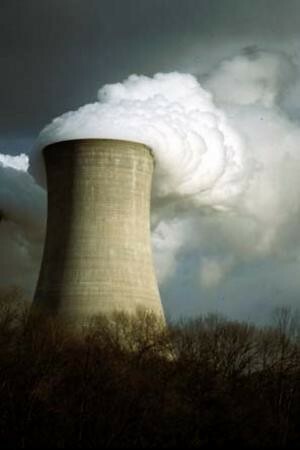 We must work to stop the building of more nuclear power plants in the U.S. Right now the government is proposing to use the $36 billion for nuclear power. Now is the time to make our voices heard, the nuclear party is over! !